Stories in The Legal Genealogist’s family take us back a long way in America on the maternal side and in Germany on the paternal side. Stories that begin, in this country, in the late 1600s. Stories in Germany that we can take all the way back to the late 1500s. Some of them, astoundingly, given my family’s tendency never to let the truth get in the way of a good story, that may even possibly be true. And some of the possibly-true ones — that is, the ones that I’ve managed to document with something other than a marginal note that one of the family storytellers told me so — had very big milestones in 2017 or will have big milestones here in 2018. 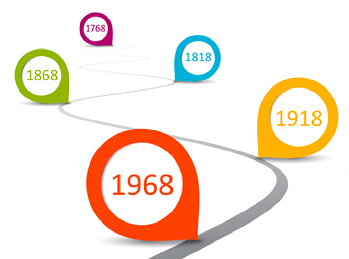 These “big milestones” are events that were exactly 50 or 100 or 150 or 200 years ago — or more! — during the year. And they’re the kinds of milestones that we shouldn’t allow to pass without pausing to reflect. Coming up in 2018, there are a lot of milestones. In the 250-year milestone category is the birth of a fourth great grandfather in Germany. Johann Jürgen Nuckel was reportedly 47 years old when he served as the informant for the death of his mother, Elisabeth (Behnhauer) Nuckel, in Bremen in 1815.7 I wish I knew more about this man, but other than the names of his wife and children and his death in 1823, there’s not a lot to go on. The marriage of my German grandparents on Valentine’s Day 1918 heads the list of 100-year milestones. Hugo Ernst Geissler and Marie Margarethe Nuckel were married 14 February 1918 at St. Jakobi Church in Bremen, Germany,17 after a civil ceremony at the City Registrar’s Office.18 Their decision to emigrate to the United States — bringing my then three-year-old father along19 — changed the course of my personal history in a big way. And of course, my family was greatly impacted 100 years ago — as were most families — by the 1918 flu epidemic. So many deaths… though it was a little too early to have been a contributing factor in the death of my grandparents’ first-born child, my aunt Ruth, who died in February 1918 and, like so many other things, changed my personal history. These are the stories we all have in our families, aren’t they? And they are, in truth, one of the real reasons why I have to write this blog. Why I have to tell the stories. To make sure that those I remember aren’t forgotten… that these milestones continue to be remembered down through the generations.